In my old job, I did not have my own office. We were in cubicle land, and if we were on a campus, we were in a conference room or a broom closet or someplace where there was room to work. So when I found out that I would have my own office, I thought I had died. When I found out that my office would have a door, with a lock? Total Nerdvana for me. I have my action figures on the shelves. I have my Yoda clock. I have my pictures on the wall. I can put my feet up, or listen to music, or cuss a blue streak, and there is not a single person to hear me and get annoyed or offended. I don't really do much of that any more, of course. Except maybe take off my shoes, and occasionally play with my action figures when I'm on hold. I don't even shut my door most days. But if I did want to be my weird self, it would be cool. That's the whole point. This morning I decided that I wanted some gummi bears. I can eat those now, and they're delicious. There was only the regular sized bag in the cabinet. I grabbed it anyway, because gummi bears. I sat at my desk, pleasantly reading emails and sorting gummi bears by colors. Because that's what I do with gummi bears. I separate them by colors and then I eat them in a specific order. Generally the greens and the reds get eaten last. I'd finished the white gummi bear pile and the orange gummi bear pile. I was making my way through the yellow gummi bear pile while eyeing the green gummi bears. And that's when I had a visitor. 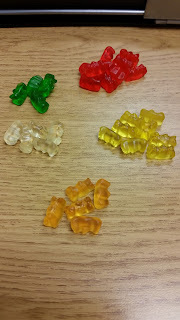 One of the new special education teachers wanted to ask me about a student, and they entered the room to find me sitting in front of piles of gummi bears. I had a moment to think about me from his point of view, about how it must look, this professional woman with all these years of experience, sitting there essentially playing with her food. I thought maybe I would feel embarrassed about that. I used to feel awkward about everything, once upon a time. I still felt awkward, but they were gummi bears. Gummi bears get a pass. "Haha! You caught me!" I laughed. "I'm a weirdo who sorts her candy by color. Hope that doesn't freak you out!" Luckily, that did not freak him out, and we had a very productive conversation while I eyed the remaining gummi bears. They were beckoning me with their fructose-y goodness, but I waited until my visitor had had his questions answered and was on his way. Then I descended upon the remaining piles of gummi bears like a Dyson. If Van Halen can be divas that have people remove all the brown M&M's from their candy mix, you can certainly sort your Gummi bears! I prefer weird people. It's the "normal" ones that scare me!